When adopted kids grow-up with kids of their own, a new maturity blooms. It can become a time to put one’s teenage angst and abandonment issues behind us so we can see our biological mom for whom she really is: someone with whom we have things in common. In recent years scrapbooks tracing the adoption journey are being trotted out to the adopted child at more and more of a tender age. I propose another alternative: have the birth mom give the gift of heritage to their child when they become adults with their own children! Regardless of whether it’s the birth mom who reconnects with her adult daughter or son – or the other way around — what if the birth mother were to creatively combine new data about who their child is today with known facts about their own history? I’m suggesting a personalized photomontage portrait that seamlessly combines photographs from the birth mom and the adopted child to create a loving portrait of the things they have in common. Not long ago, I created one of these digital photomontages for Theresa G, a birth mom, who planned on giving it to her daughter Liz on her 30th birthday. It shows the many things she has in common with her daughter, down to the way they both wore their hair in their 20s. It also includes the many Celtic and Polish connections they discovered (when they finally met) flowed through their lives by birth or marriage. In addition to pleasing Liz, this piece of artwork I call a “Healing Dreamscape” was also meant to pay homage to the couple who raised Liz. In a 19th century Polish kitchen that anchors the photomontage, I hang a photo of Liz’s adoptive parents’ from a little peg, highlighting their faces in the warm light. 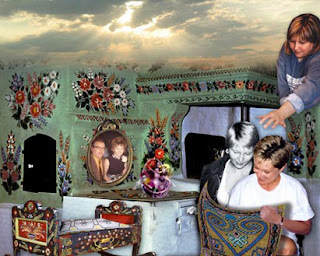 In Liz’s Healing Dreamscape we see everything through the lens of Liz’s biological mother: the Polish hearth and crib; the Celtic baby blanket; an Easter basket belonging to Liz’s daughter. Yet if Liz were to share this photo gift with her adoptive parents, its intrinsically non-verbal nature makes it non-threatening in great part due to the Healing Dreamscape’s multi-layered meaning. As an artist, I deliberately embed these photomontages with symbolism and metaphor to free the birth mom from worrying about overstepping her boundaries. The Christ figure in the basket represents Liz’s strong faith. The cloth with the Celtic heart which Liz and a younger Therese clasp between them represents the eternal mother-daughter bond. This greatly helped Theresa when she accompanied the Healing Dreamscape with a letter-poem to her daughter, allowing her to lovingly interpret the elements in the artwork rather than be more literal about how Liz should feel about her adoption, her adoptive parents or her future relationship with her birth mom. In other words, it puts any nagging worries of the adoptive mom to rest, such as: Was I a good parent? Does my adopted child know how much I love her? I will interview you, the birth mom, about how you and your adult child ultimately found one another. I will type while you’re talking or turn on a digital tape recorder, so I can capture every precious word. I will ask for (candid) photographs of what you, the birth mom, look like today, and also at the age that your adult child is now. We will go over these photos to help jog your memory for the back stories. I will request photos of you, the birth mom, spending time with your adult child and his/her children, if available. If appropriate, I may also request a (more formal) photo of your child’s adoptive parents, if it is your child’s wish to include them in some form. Unlike the role adoptive parents take on as family historians when they trace the Adoption Journey in a scrapbook, the Healing Dreamscape assigns a different kind of role to the birth mom — that of Guardian Angel. Present this kind of personalized photo gift on your adult child’s birthday – if they are open to it – and you’ll walk on water. It’s one of the rare gifts that is truly self-less. I can say from experience that giving a Healing Dreamscape to the child you gave up for adoption produces so much goodwill inside that whether the birth mom can deliver this gift in person or whether there is a present in return is really inconsequential. "Pick out something she would have loved, take it home, wrap it up, write a card, and then give it to someone who'll love it."